People have been eating fish since the dawn of man. It has been a staple for people in every area where fish can swim and has without a doubt been one of the foods that has kept people alive. Fish is a lean protein, with vitamins, minerals, fatty acids and numerous compounds that can stave off high blood pressure, macular degeneration, depression, osteoporosis and diabetes. Another new study in the journal Circulation reveals that people who eat 2 or more servings of oily fish per week had a “significantly lower risk of heart attack and stroke,” even in individuals who do not make eating healthy a priority. 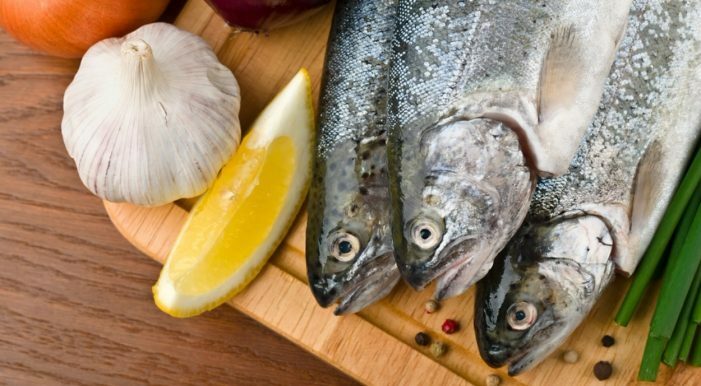 One of the most glowing reviews of fish as a healthy food was in light, again, of the high levels of omega-3s, with a notation that they’re one reason the Mediterranean diet has been very popular over recent years. Omega-3s enters our cell membranes, which is important for cell signaling and essential for an optimally functioning heart. The Big Q: So should we eat fish? The Big A: Yes, choose the healthiest options for the best benefits. As a general rule, your best choices are small, cold-water, fatty fish, which are an ideal source of omega-3s with a low risk of contamination. The healthiest fish include anchovies, sardines, mackerel, herring and wild-caught Alaskan salmon, do not ear farmed varieties, both for your health and for the environment.